Friday - We had an amazing ride today! 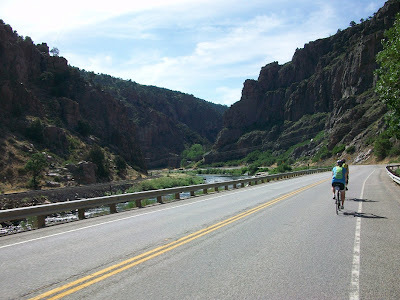 We followed the Arkansas River down the mountain, riding through canyons where at times it was just the river, the road, and the railroad enclosed by canyon walls over 100 metres tall. I thought this picture turned out quite well considering that I took it one-handed while cycling, but neither words nor pictures can really do it justice. We started the day just outside Salida and my group took a detour through their beautiful downtown. 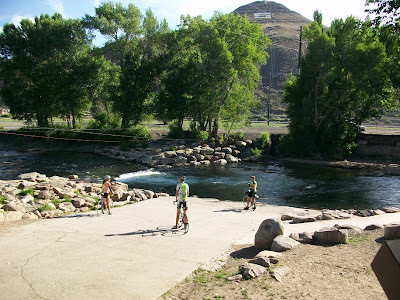 We stopped at a cafe for coffee and pastries and then rode a nice path along the river where people could stop to go swimming or tubing down the river. I guess your next life challenge, Mike, will be white-water rafting on the Arkansas River? I'd totally join you on that adventure, brother! Some of the riders actually did that. I overheard them saying there were a few eight foot drops. I've never gone white-water rafting, but I'd love to give it a try some day! If I fall out of the raft, I expect you to jump in after me :-).